When looking for ways to increase crop yields we usually want something that is safe for the environment, safe for us and able to give us a substantial bang for our buck. 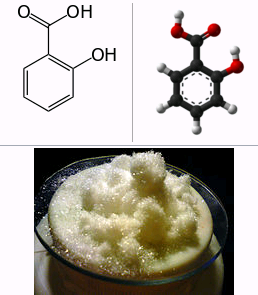 From the multitude of additives that have been researched during the past 30 years one simple organic molecule seems to fit all the requirements very well: salicylic acid. Today we are going to talk about why this additive is so interesting for use in hydroponic culture, the results it has shown in peer reviewed publications and how we can use it to increase our crop yields. For those of you interested in this molecule I would also recommend reading this 2010 review which contains a much more detailed look into the scientific literature surrounding salicylic acid research in higher plants. Salicylic acid is a simple organic molecule with the structure showed above. We have known for a long time that plants produce it and we knew almost right from the start that it played a key role in plants' response to diseases and stress (see here for some early insights from Tobacco cultivation). Salicylic acid is used as a signaling molecule in plants (a.k.a hormone), moving from stressed organs to non-stressed ones as the plant is attacked. However its role is much more complex, having functions related with chloroplast creation, inhibition of fruit ripening and many other important processes. After learning that this was an interesting molecule it wasn't long before people started studying whether exogenous applications provided any benefit. We have learned that it enhances dry mass and leaf area in corn and soybean (here), that it can enhance germination in wheat (here), the oil content in basil (here), the carbohydrate content in maize, etc. There are also several studies pointing to improvement in root development - even from foliar applications (here) - suggesting that this hormone is able to increase plant productivity through several different mechanisms. The incidence of diseases can also be reduced dramatically by salicylic acid applications (here). We also know this molecule has important effects on the flowering process. It can induce earlier flowering in plants and can often cause larger fruit settings in some plants (like papaya (here)). Most importantly foliar spraying of tomato and cucumber plants with salicylic acid has showed important increases in yields (here). It is therefore clear that exogenous applications of salicylic acid can have many important benefits in crop production and this is therefore an important candidate to consider for enhancing crop production. But how do we apply it? Most commonly this molecule is applied in foliar feeding regimes, although in some cases it is also applied directly in hydroponic solutions. Most commonly concentrations in the order of 10-5 -10-4 M are used since it has been showed across a few studies that negative effects start to show up when the concentration level reaches 1mM. This means that regular doses will be around 1-100 ppm with the lowest spectrum of dosage being preferred if the effect on the particular plant is unknown. The solubility of salicylic acid is 2.48g/L at 25°C so concentrated solutions of up to around 20-30x can be prepared without issues to make it easier to apply on plants. The preparation of more concentrated solutions requires some tricks but it certainly can be done. Salicylic acid also has the advantage of being a very safe molecule so it can be applied without a lot of worry in order to experiment with its effects. For testing on new plants foliar applications of 20-30ppm would be most common, with applications usually carried out once every 5-10 days. The frequency of application as well as the best concentration to use will of course depend on the particular plant you're growing. There are also several other molecules that can be used with salicylic acid to enhance its effect on some plants, but this will be the focus of a future post. Finally it is also worth noting that salicylic acid is not aspirin (aspirin is acetylsalicylic acid, a related yet different molecule) so if you want to experiment with this additive you should buy salicylic acid instead of just "dumping some aspirin" into your foliar or hydroponic nutrient solution. Hi Tyler, Thanks for commenting! 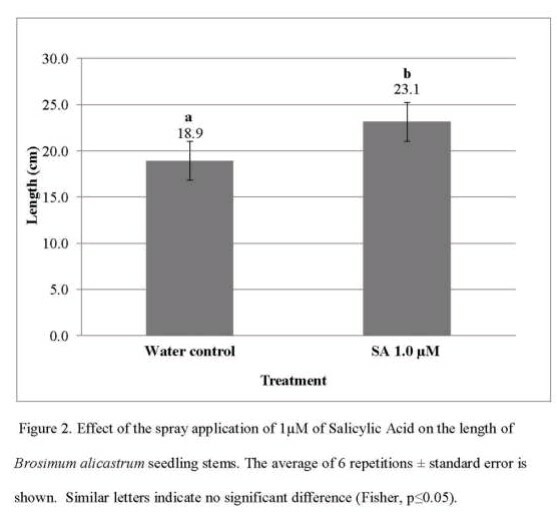 Note that salicylic acid applications to the nutrient solution have a different and much lower effect than foliar applications (this is the reason why research around root applications of salicylic acid is not very common). Also while aspirin is not salicylic acid the effects can be similar on some plant species (although not on others), so your additions haven't probably been a complete waste of time. However if what you want is the effects shown in research then definitely get salicylic acid. Thanks again for writing, Best Regards, Dr. Daniel Fernandez Ph.D.
Salicylic acid doesn't seem to be soluble in water. If applying with the hydroponic feed in the reservoir, is there any way to prevent it from settling (mixing pumps I suppose)? The solubility of salicylic acid is very significant, even at its lowest point (1.24g/L near the freezing point of water). You will have no problem dissolving the small concentration needed in a nutrient reservoir. However - as I noted in my reply to your other comment - root application of salicylic acid is not the optimum administration route. Thanks again for commenting! Thanks for the replies! With the acetylsalicylic acid, I have been adding a 325 mg tablet per gallon of feed solution, which I believe is about 84ppm concentration. I found some salicylic acid powder laying around, which I'm going to start using instead. If my math is right, adding 0.1g per gallon of solution should put me at about 26ppm. I'll give this a shot for foliar and potentially in the reservoir. Unless there's a specific benefit to dissolving in to a stock solution first. Thank you for advice . Can i cure plants by salicylic acid in the salting of soil . for example for plants necessary 1.8 mS but soil already collected 3.5 ms . How do you think acid can help decrease stress of plant and cure ? Great article! I also hear it makes a decent chelator for metals. I may just use it for chelating micronutrients, but I do wonder what effect adding this phytohormone to DFT hydroponic reservoirs will have on plants... Any thoughts admin? How much Salicylic acid in grams per gallon should be mixed to reach the 10-5 -10-4 M solution you stated? Sorry for the lack of knowledge with understanding the chemistry but, I’ve never worked with chemistry. Just a simple farmer :) Thank you for any help understanding Dr. Fernandez.